You've probably seen blinking text on the internet, then clutched your head and wondered why your elders ever invented such an affront to eyeballs everywhere. Now its inventor Lou Montulli has come forward to take responsibility, and to explain why <blink> was never supposed to exist. Sometime in late summer I took a break with some of the other engineers and went to a local bar on Castro street in Mountain View. The bar was the St. James Infirmary and it had a 30 foot wonder woman statue inside among other interesting things. At some point in the evening I mentioned that it was sad that [text-based browser] Lynx was not going to be able to display many of the HTML extensions that we were proposing, I also pointed out that the only text style that Lynx could exploit given its environment was blinking text. We had a pretty good laugh at the thought of blinking text, and talked about blinking this and that and how absurd the whole thing would be. In the end, much was said, most of it in the form of flaming posts to various discussion boards, and the <blink> tag will probably be remembered as the most hated of all HTML tags. 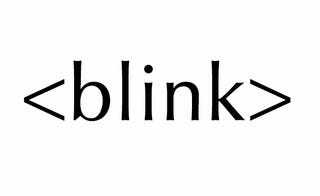 I would like to publicly state that at no time did I actually write code or even seriously advocate for the <blink> tag. It is true that I put forth the initial inspiration, but it really was merely a thought experiment. I am not going to name any names of the people who coded the dastardly deed, if they wish to step forward, they will need to do it themselves.